Ten years ago on 19 October 2003, Atacama Skeleton was found by a Chilean man called Oscar Munoz in La Noria, a ghost town in Chile’s Atacama Desert when he was looking for historical value objects. He said he found an odd-shaped objects near an abandoned church which apparently the skeletal remains of a tiny creature wrapped in cloth. The 15 cm (6 inch)-long “Atacama Humanoid” – nicknamed Ata – had a bulging head with a lump on top, hard teeth, dark, scaly skin, and nine ribs. Although initially thought to be older, the remains have been dated to the last few decades. Judging from the odd head shape, Ata may have also suffered from Oxycephaly. There are several hypotheses about what Ata is. It's odd rib count and huge head led some to think it was some kind of extraterrestrial creature. Others suggested it was a monkey or an aborted foetus. After studying a DNA sample from bone marrow in one of the creature’s ribs, a group of scientists have concluded that Ata is an “interesting mutation” of a male human that had beaten the odds at birth and lived for between six and eight years. Garry Nolan, the director of stem cell biology at Stanford University’s School of Medicine in California said, he absolutely sure that it's not a monkey. During the DNA analysis, the B2 haplotype group was found. Combined with the alleles from the mitochondrial DNA, it suggested that Ata is indigenous to the west of South America. It is closer to human than chimpanzees. How Ata survived is unknown. “After six months of research by leading scientists at Stanford University, the Atacama Humanoid remains a profound mystery,” said Dr Steven Greer, founder of the Disclosure Project. The test results are included in a recent documentary called Sirius, which explores the subject of UFO and ET visitation, the disclosure of secret UFO files, and the investigation of advanced energy and alleged alien propulsion technologies. 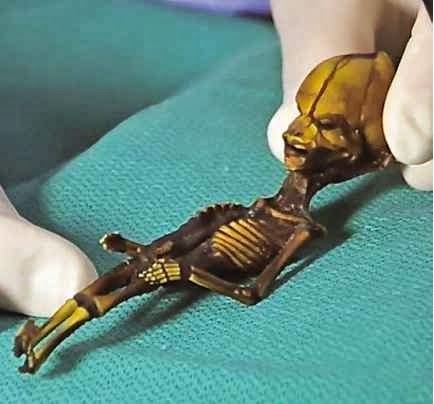 Curiously, another tiny ‘humanoid’ had allegedly been found in Chile a year earlier, in October 2002.The discovery was made under some bushes in the southern town of Concepcion by a small boy called Julio Carreno.